I’ve always enjoyed fairy tales and became a bit obsessed once I discovered the darker original Grimm Brothers and Hans Christian Anderson collections. 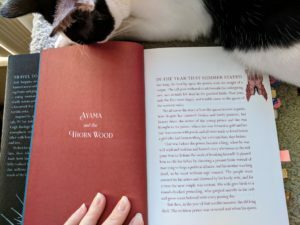 This book evokes those tales but the stories have been spun in different and interesting directions, in part because it was created as a volume of fairy tales that the characters in the Grishaverse (the world setting Leigh Bardugo created) would know. In 2012 Leigh’s publisher asked if she would write a prequel story for her first novel Shadow and Bone. But instead of ideas for that, what came to her was the concept of writing stories her characters would have been told as children. 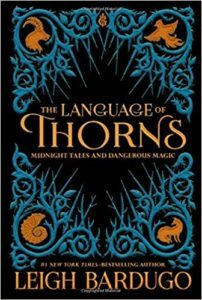 In 2017 it was finally published as The Language of Thorns: Midnight Tales and Dangerous Magic with the tagline on the back saying, “Love speaks in flowers, truth requires thorns”. It is intended as a standalone volume but if you are a reader of the trilogy and duology in the Grishaverse it adds an extra layer of world building. When I put this on my wish list I didn’t know that it was part of an extended world setting. Assuming it was just fairy tales that the author had created independently. After reading it I am eager to explore more in the Grishaverse. 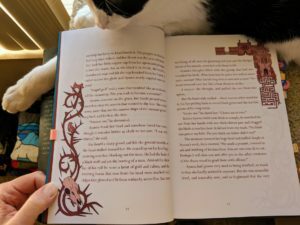 I first heard about The Language of Thorns because of its art, how the images on the cover tie into the stories within the book and that there was art throughout. And while the cover is stunning (those orangey bits are actually a metallic bronze), it is the art inside that is unlike any I have seen accompanying a story. Every page has art in the margins that grows with the story, adding details from what is happening on the page. By the end, the margins are completely filled. The last two pages of each story are full illustrations showing the finale of the tale. Each story starts with a single illustration. This is the end but not the final illustration pages as they seemed too spoilery. The book is printed in both this dark red ink and a blue, the text alternating colors between stories. The illustrations are predominately one color to coordinate with the text, with the art for the final tale in both. 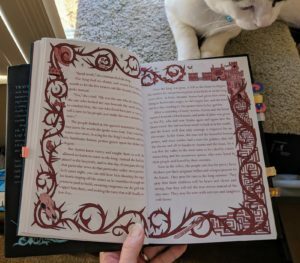 This is the most gorgeous book I have ever owned and I’m very grateful to Bunnybean for sending it in the Cannonball exchange! Wonderful as the art is, it is mere window dressing for the fantastic stories within. I laughed out loud when in the first story a grandmother tells her plain granddaughter, “Come now, Ayama. You know how the stories go. Interesting things only happen to pretty girls; you will be home by sunset”. Of course Ayama goes off and interesting things do happen to her but it was funny to have a character directly address a common trope and use it as reasoning for her granddaughter’s safety. In the next story a Duke is seeking a husband for his beautiful daughter and sets forth tasks for prospective suitors, such as creating the largest pile of wood. The daughter questions, “Papa, forgive me, but what way is this to choose a husband? Tomorrow, I will certainly have a lot of firewood, but will I have a good man?”. That story also contained a lovely bit of wisdom, “remember that to use a thing is not to own it”. The last story, “When Water Sang Fire” is my favorite in the collection, perhaps because I love the fairy tale that inspired it. I was taken by delighted surprise when I finally realized where the story was going. Many of the stories were like that, the charm of recognizing the inspiration and then the enchantment of the discovering the new way Leigh takes that starting point and weaves her own creation. There were so many things I liked in this book, as you can see from my tab stickers. Leigh writes with creative and evocative descriptions like this, “Kneeling there, you hear the ice moan. The wind scrapes away at you, a razor on the strop.” or “But when Signy looked at Ulla and grinned – shyly, a star emerging at twilight – all of that bitterness dissolved, gone like words drawn on the ocean floor”. The stories are just familiar enough to feel as though you might have read them before but unique enough to stand on their own. The combination of excellent writing and beautiful illustrations make for a lovely book on every level, 5 stars all the way! Share the post "If you love fairy tales"
I’m so glad you enjoyed this! We most definitely enjoyed picking it out for you! It really is the absolute most gorgeous book.